You are viewing the archived NBN providers ratings. Follow the link to view the current NBN providers ratings. If the time has come for a switch to the NBN, compare service providers with our customer satisfaction ratings. 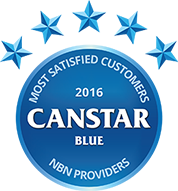 Canstar Blue research finalised in February 2016, published in March 2016. So in these early days of the NBN, which service providers are deemed to offer the best value for money, customer service and, crucially, network performance? To find out, Canstar Blue surveyed hundreds of bill-payers, and as you can see from the ratings table above, TPG has been named top dog for overall NBN satisfaction. As the digital demands of Australians continue to grow, so too are our expectations and desire for high-speed broadband. Fortunately, the rollout of the National Broadband Network (NBN) is coinciding with our new found love of subscription video on demand (e.g. Netflix) and many households are now benefiting from the best broadband plans money can buy. How fast does the NBN get? You should keep these speed tiers in mind when you search for the best NBN plan for your needs. To help you put these speeds into perspective and decide which level is right for you, see our helpful guide. Is the NBN value for money? For many people, the arrival of fast fibre-optic cable to their street will be greeted with relief, particularly if you’re familiar with the frustration of a slow or unreliable network. If the NBN hasn’t arrived in your area yet, you’ll know when it has because you’ll need an NBN utility box installed outside your home and NBN connection box inside. Don’t worry, this won’t cost you anything. Once the NBN has reached you, existing phone lines and ADSL and cable internet services will all be disconnected. When that happens, you will need to choose a NBN service provider. It could be your existing one, or you could take the opportunity to switch. So, will the NBN cost you more, and is worth the money? In general, the NBN shouldn’t be more expensive, unless you decide to opt for faster speeds – and you will be tempted. The Government is controlling wholesale pricing to make sure that households can connect to the network as a reasonable price. According to WhistleOut, the price of tier 1 and 2 NBN plans is generally in line with those for a standard ADSL2+ connection, even when bundled with a home phone or TV service, which is good news if you don’t want to pay more than you currently are. However, if you decide to go with the faster tier 4 or 5 plans, or buy a ‘speed boost’ on a standard NBN plan, you should expect to pay more for the improved service. And it seems that many NBN customers have taken the opportunity to dramatically improve their internet speeds as our survey found households on the NBN are spending an average of $77 per month for their services. This compares to just $68 per month for those still on ADSL plans. Interestingly, those NBN customers who have been with their broadband provider for five years or more (i.e. they have the same ISP supplying their NBN as they had previously) are paying an average of $80 per month. By contrast, those who have switched providers over the last five years (before or after the NBN came to town) are paying just $73. This really does emphasise the importance of comparing your options and taking your business elsewhere if you’re not entirely satisfied. So is the extra cost worth it? Our survey found that four out of five (80%) NBN customers are glad they switched to the NBN, but just 71% believe their NBN plan represents good value for money. If you’re one of those feeling a little underwhelmed by your NBN plan, the good news is that there are literally dozens of service providers queuing up to offer you a better deal – many of which you have probably never heard of. With so much competition in the market, think carefully before signing up to a lengthy contract, because you’ll want to keep your options open in case another provider comes up with a tempting offer. And if you are wondering whether the NBN switch was worth the extra cost, it could be that you’re paying a level of service you don’t really need. If that’s the case, talk to your provider about downgrading your plan and you might find your internet demands are met at a lower price. Yes, the NBN and prospect of high-speed broadband is very exciting, but remember to do your homework and regularly compare providers and plans. Canstar Blue commissioned Colmar Brunton to survey 6,000 Australian consumers across a range of categories to measure and track customer satisfaction. The outcomes reported are the results from customers within the survey group who have an active NBN account in their name and they pay the bills – in this case, 375 people.